As summer approaches, we try to lighten up our menu and offer refreshing dishes like a recent favorite... Mediterranean hummus. 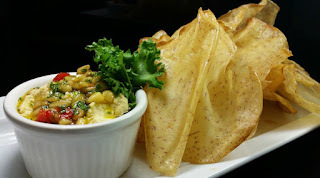 Our fresh, housemade roasted garlic hummus is the perfect summer appetizer to help you beat the heat. Served chilled, our version is made with freshly ground chick peas, roasted garlic, and tahini paste (made from a base of ground sesame seeds). While hummus has become a fairly popular dish in American cuisine, what we serve with ours is far less mainstream. We're serving up our hummus with freshly fried taro chips, the perfect accompaniment to this cold dip. While many of us have given hummus a try (or are at least aware of its existence), can you say the same for taro? What is it? Taro is a large perennial plant that grows up to 5-6 feet. Its rather large heart-shaped, frilly edged leaves at the end of long, stout petioles appear like an elephant’s ear. It grows best in marshy, wet soil and warm humid climates (think Hawaii). 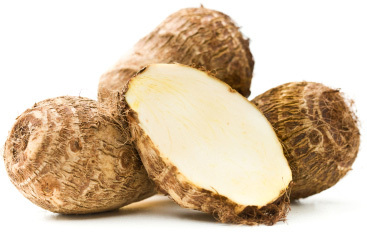 The plant itself produces the edible taro root vegetable, called a corm. The corm grows to the size of a turnip and has an oblong shape with brown skin. Inside, its flesh is white to cream-yellow. An average-sized corm weighs about 2-4 pounds. Its delicious, crispy-textured meat becomes soft and edible once cooked and has a nutty flavor like that of a water chestnut. To create our taro chips, we divide the root vegetable into thin slices before dipping them just briefly in our fryer to give them a crispy texture similar to a potato chip. This very light, all-natural chip is what we believe our hummus was made for! Taro corms possess more calories than potatoes. 100 grams of root provides 112 calories. Their calorie value chiefly comes from complex carbohydrates. Nonetheless, the roots are very low in fats. Their protein levels can be comparable to that of other tropical food sources like yam, potato, and plantain. The corms are free from gluten protein. They carry a high-quality nutrition profile of dietary fiber and antioxidants in addition to moderate proportions of minerals and vitamins. Taro is one of the finest sources of dietary fibers. 100 grams of flesh provides 11% of ones daily requirement of dietary fiber. Together with slow-digesting complex carbohydrates, moderate amounts of fiber in the food help gradually rise blood sugar levels. Yellow-fleshed roots and young, tender leaves have significant levels of phenolic flavonoid pigment antioxidants. Consumption of natural foods rich in flavonoids helps protect from lung and oral cavity cancer. So think twice before you order that next round of 'shrooms. You may just find a new appetizer favorite!